Growth in the global economy is expected to slow in 2019 from 2018. Ten economic forecasts released in the last two months show the percentage point change in World GDP from 2018 to 2019 ranging from minus 0.1 points to minus 0.4 points. The major contributors the slowing growth are the two largest economies, the United States and China. Together these two countries account for about 39% of world GDP, according to the IMF. Euromonitor forecasts a half point deceleration in GDP growth for both the US and China from 2018 to 2019. Euromonitor cites trade tension between the US and China as a major factor in the slowing growth of each economy. Other factors are a maturing of the US business cycle and the continuing slowing growth of China. What is the effect of GDP on the semiconductor industry? Semiconductors are basically at the bottom of the food chain. Demand for semiconductors is dependent on the growth of end equipment such as computers, mobile phones, automobiles and manufacturing equipment. The growth of the end equipment is dependent on overall spending trends by consumers, businesses and government - major components of GDP. As GDP accelerates or decelerates, the effect on the semiconductor market is generally more volatile than the GDP change due to factors such as capacity, inventory changes and price changes. Semiconductor Intelligence have developed a model to forecast the semiconductor market based on changes in global GDP. The model is more accurate when the memory market is removed from the total semiconductor market. The memory market (primarily DRAM and flash memory) can be very volatile. WSTS (World Semiconductor Trade Statistics) in November forecast the memory market will be basically flat in 2019 after 33% growth in 2018. IC Insights projects the DRAM market will decline 1% in 2019 after 39% growth in 2018. We used our Semiconductor Intelligence (SC-IQ) GDP model for the semiconductor market excluding memory. The result was 7.2% growth in 2018 slowing to 6.3% in 2019. Using the WSTS forecast for memory results in total semiconductor market growth slowing from 15% in 2018 to 4% in 2019. This is slightly lower than our September forecast of 16% in 2018 and 6% in 2019. 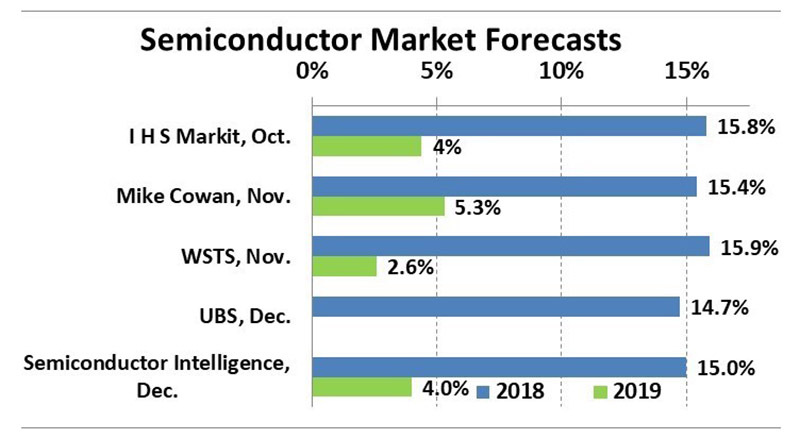 The chart below compares Semiconductor Intelligence’s latest forecasts with other recent forecasts. The consensus is the 2018 semiconductor market will finish with about 15% growth. All sources expect a significant growth slowdown in 2019. Most are in the three to five percent range in 2019. UBS projects a 4.3% decline in 2019 primarily due to a downturn in memory. There are considerable downside risks to the forecast. Global GDP risks include the US-China trade issues, Brexit, and rising interest rates. On the semiconductor side, the memory market downturn may be more severe than the flat market projected by WSTS. Previous booms in the memory market have usually been followed by double digit declines. However, since the significant memory suppliers have been winnowed down to three in DRAM and six in flash memory, the decline should not be as extreme as in previous cycles. The traditional major end equipment drivers of the semiconductor market such as PCs and mobile phones have shown little growth in the last few years. Semiconductor Intelligence will attend CES 2019 in Las Vegas next month to look at emerging drivers of electronics and semiconductor growth.